On a lovely Tuesday in February, Stella, one of our receptionist, and I went to enjoy an amazing lunch at Elephant café. What a treat this was and let me tell you why…. At around 10 am in the morning we were picked up and dropped at the David Livingstone Safari Lodge where the speedboat was waiting for us. Very lucky, we got to sit in the front and together with 6 others, off we went for a short river safari on the beautiful Zambezi River. 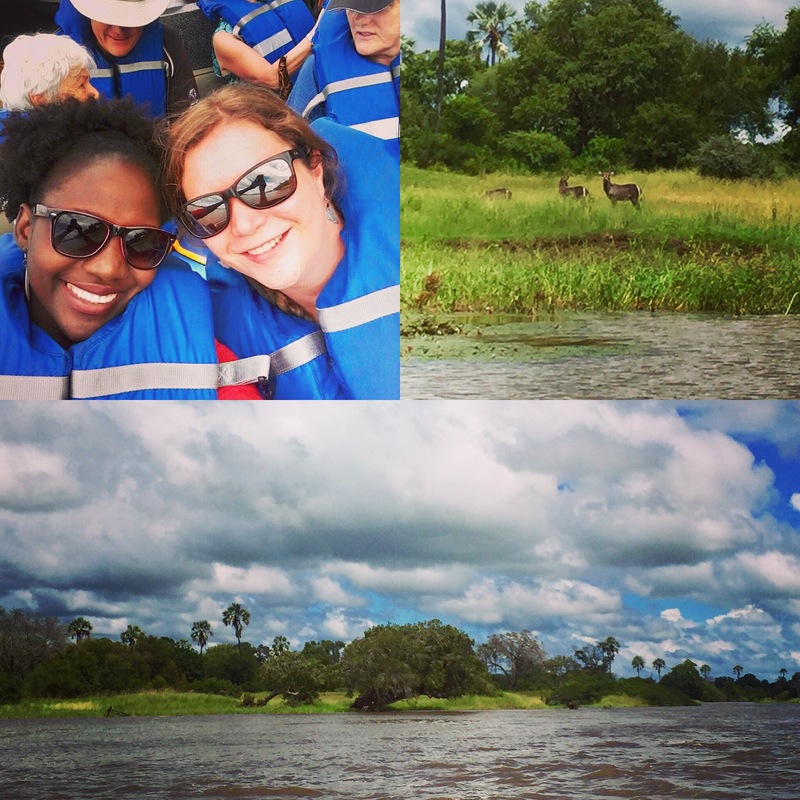 We found a large pod of hippos relaxing and spotted some waterbuck on one of the many islands. From the river we could see the elephants waiting for us. 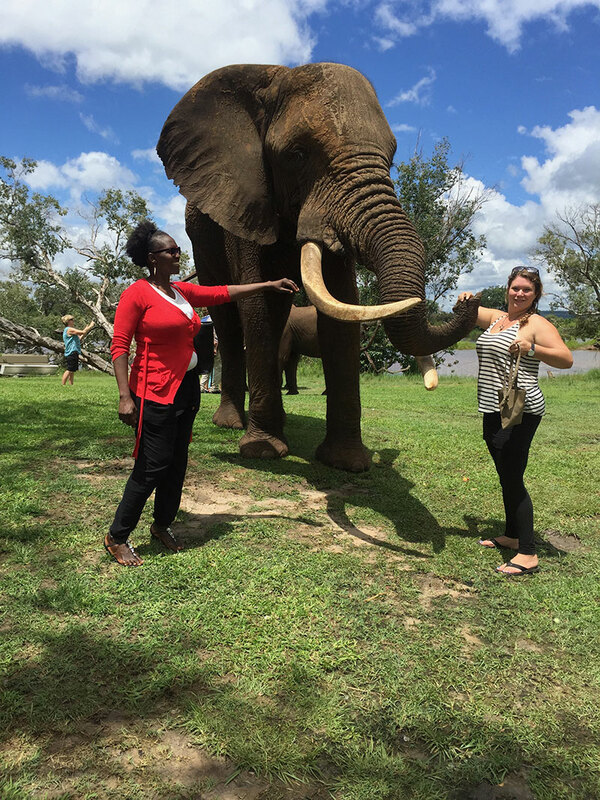 It is easy to forget how big elephants actually are, until you stand next to them! We met little Muyuni first, Muyuni is a 3 year old bull born on the 29th of December 2013. He was very calm and enjoyed the bag of pellets, pushing his trunk down hard into the bag to eat them quickly. Three and already incredibly strong. It was time to meet Mashumbi, Muyuni’s mother, the matriarch of the herd. Like her son she was very kind and seemed to enjoy the photography. Many selfies later, we saved the biggest one for last. Danny the dominant bull of the herd, his tusks are mighty impressive and his trunk was very eager for more and more pellets. It was time to step back and watch the rest of the herd come out and pose for photos. It was wonderful to see them calmly room around the grass and wander off to the river for a drink and before we knew it lunch was ready. 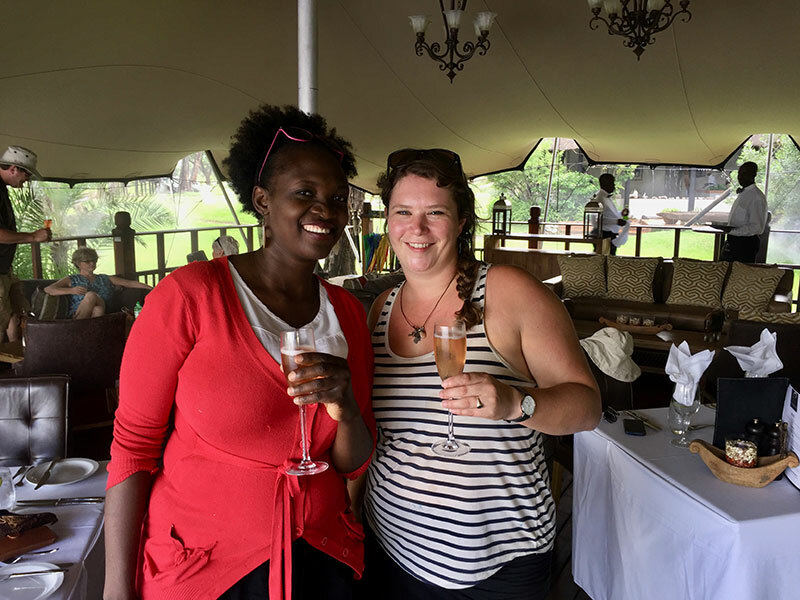 Welcomed with a glass of bubbles, we were seated at our table with a view of the Zambezi river and presented with the menu. 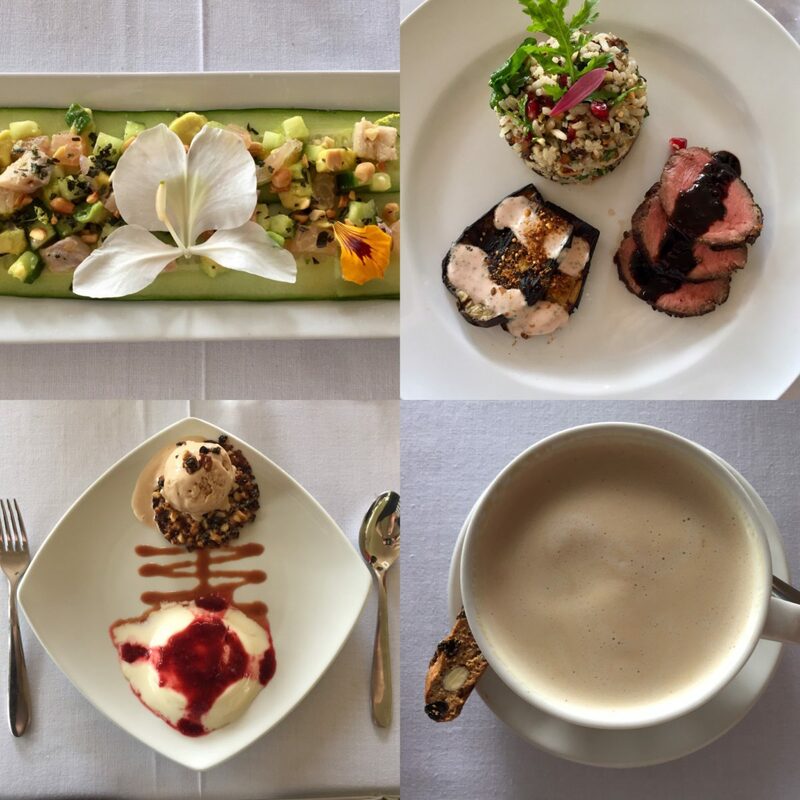 The menu is incredibly inspiring and quickly makes your mouth water with anticipation. Annabel Hughes, the chef welcomed us and explained the menu. They use only locally sourced ingredients, this mixed with traditional foods, such as Mongogo nuts, will make your tastebuds very happy! (Mongogo nuts come from trees which grow locally in the Livingstone area.) After relaxing with a cup of coffee served with a delicious bush biscotti, it was time to board the boat. With big smiles as the wind was blowing through our hair, we made our way back. The combination of meeting elephants, absolutely delicious food and amazing service made it an experience we will both never forget. A big thank you to Jollyboys Backpackers and Camp, Safari Par Excellence, the elephants, the chefs, all staff and Annabel Hughes for a delightful day!